It's that time of year when finding time to stamp is hard but I needed to make some last minute cards for a military wives Christmas card swap so I sat down and had some fun with some MFT Stamps. 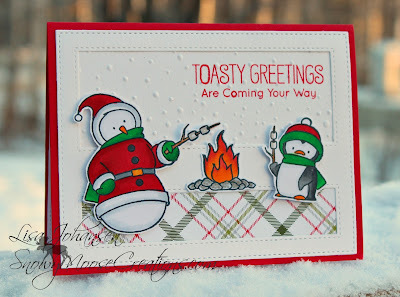 How cute are these guys from the Toasty Greetings set? I can't believe this is the first time I've inked up the set since getting it in November! The stitched horizontal cover up die makes it so easy to create a fun and fast background, I love it! Super cute and toasty indeed. Great job.